Triumph are readying a new Street Triple roadster range, which will feature larger-capacity engines developing up to 125bhp, and a host of new technology, from digital full-colour clocks to multiple rider modes. The information has come to light after details of a Triumph market research survey conducted with owners of the existing model was leaked online, which clearly outlines the detail of a four-model range. This type of market research is not unusual as motorcycle firms attempt to both validate their own decisions but also work out what customers are willing to pay for, along with what they want from new models. This survey, coupled with recent spy shots of two variants of Street Triple being tested, adds weight to speculation that one of Triumph best-loved, most popular and biggest-selling machines is about to undergo its first wholesale revamp since its 2007 introduction. In 2013 the Street Triple range was given a mid-life refresh that saw a modernisation of the engine, chassis and weight reduction thanks to a redesigned underbelly, and a new Rx version for 2015 saw the bike mated with a tail unit from its Daytona 675 stablemate. 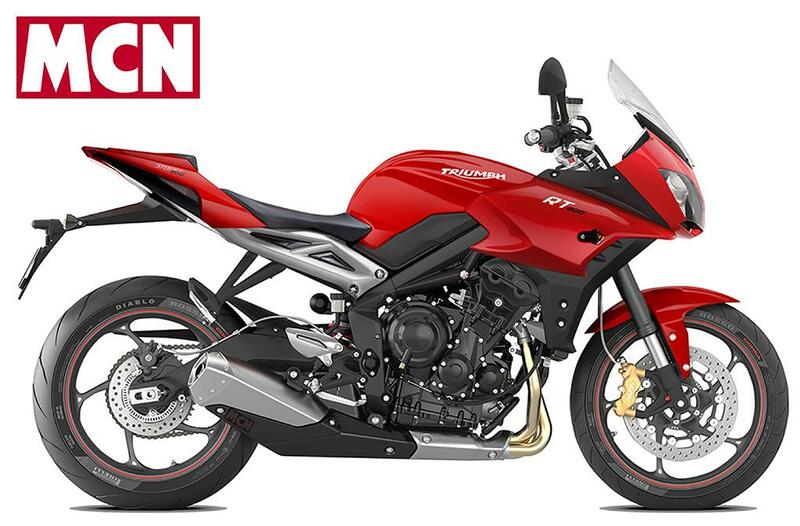 But with three-cylinder rivals such as the MV Agusta Brutale 800 and the smash hit that is the 847cc Yamaha MT-09 range, Triumph is under pressure to increase the capacity of its ever-popular Street Triple 675. MCN understands the firm are working on a version of around 800cc, using a development of the existing bike’s 675cc triple and appearing in a revamped and extended range to broaden the versatility and appeal. Tiger 800 – which uses a longer-stroke version of the same engine to achieve its 799cc capacity – the factory have so far resisted the change, saying that the lazier, slower-revving Tiger engine isn’t suited to a sporty roadster. While that’s true enough, the demand for more capacity and more performance is undeniable. The Tiger 800’s internal dimensions, with a relatively long 61.9mm stroke and the same 74mm bore as the 675cc Speed Triple, mean its 94bhp peak power is actually lower than the existing Street Triple’s 105bhp. 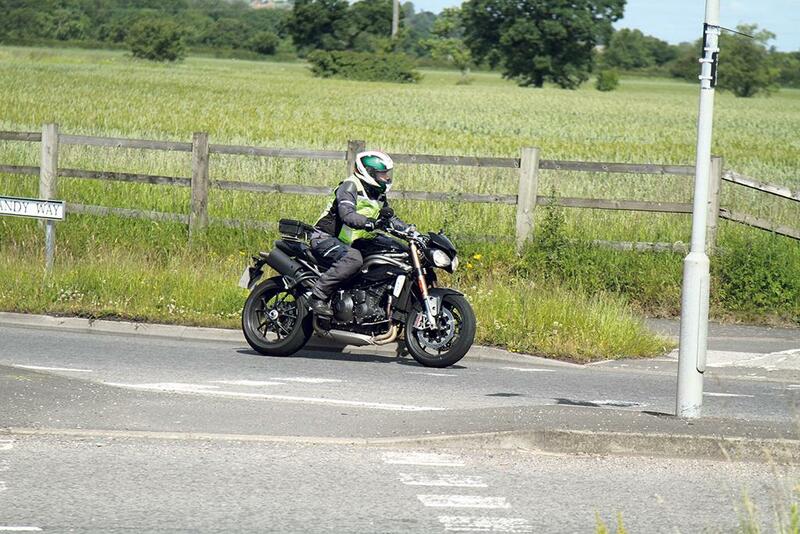 Instead it gains a wider spread of torque, which is what you want in an adventure bike. To create a bigger-capacity Street Triple, with a target of 125bhp for the most powerful version, Triumph are likely to use a shorter stroke and bigger bore. A good template might be something around 76mm bore against a 56mm stroke, which would give around 762mm and a nice balance of both power and torque. This compares to the 79mm bore and 54m stroke of the similarly-configured MV Brutale 800, which makes the same 125bhp Triumph are targeting. adjustable Kayaba kit at both ends, and the brakes are Nissin – just like the current bike. A price of £7790 is mentioned, around £300 more than the current 675, and hinting that there’s no chance of both models coexisting. Next up comes the Street Triple R, with another 5bhp to take it to 115bhp, adjustable Showa suspension, three riding modes and radial Nissin brakes, priced at a projected £8790. 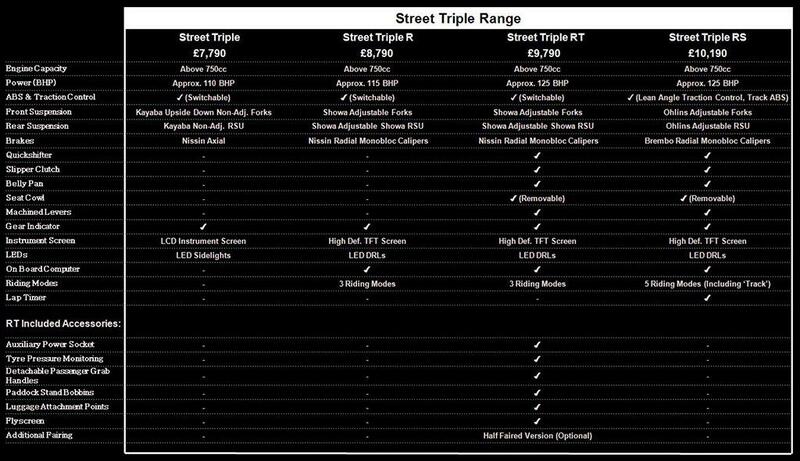 So far, so similar to the current range, but then we get two further versions - the Street Triple RT and Street Triple RS. The RT, as the designation suggests, is a sports-touring derivative, with power upped to 125bhp and the same brakes and suspension as the ‘R’. 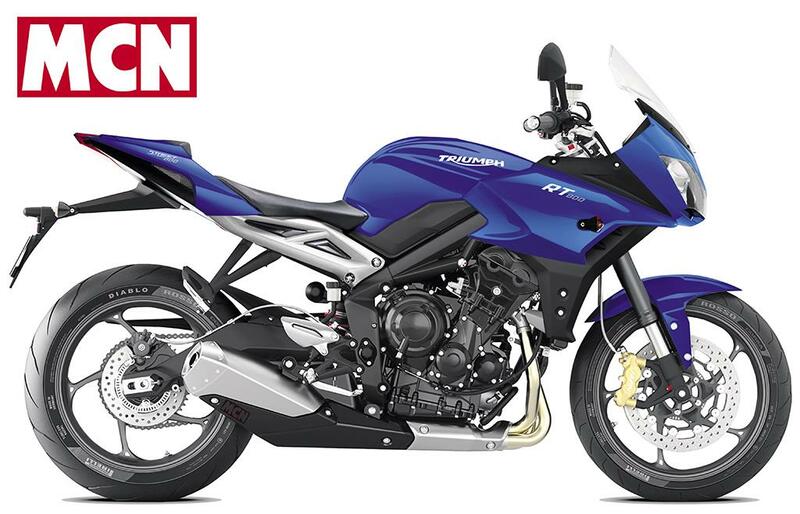 It also gains a seat cowl, accessories including tyre pressure sensors, luggage attachment points and an auxiliary power socket, plus the option of a half fairing – a first for the Street Triple and aimed at making a dent in the MT-09 Tracer’s success, and in anticipation of the arrival of an MT-07 Tracer (MCN, June 24). The price is estimated at £1000 more than the R.
Right at the top of the tree is the RS, more expensive still at £10,190, but with a specification to match the price. While losing the touring-style extras of the RT, it gains Öhlins suspension at both ends and Brembo monobloc radial calipers, as well as an extra pair of riding modes, taking the total to five. Of course, a survey alone isn’t proof that the bikes are anything more than figments of a Triumph marketeer’s imagination, even though the existence of other three-cylinder rivals – particularly the bargain-priced, £6949, 115bhp Yamaha MT-09 and its Tracer, Street Rally and Sport Tracker derivatives – means Triumph can’t afford to leave the Street Triple unchanged. 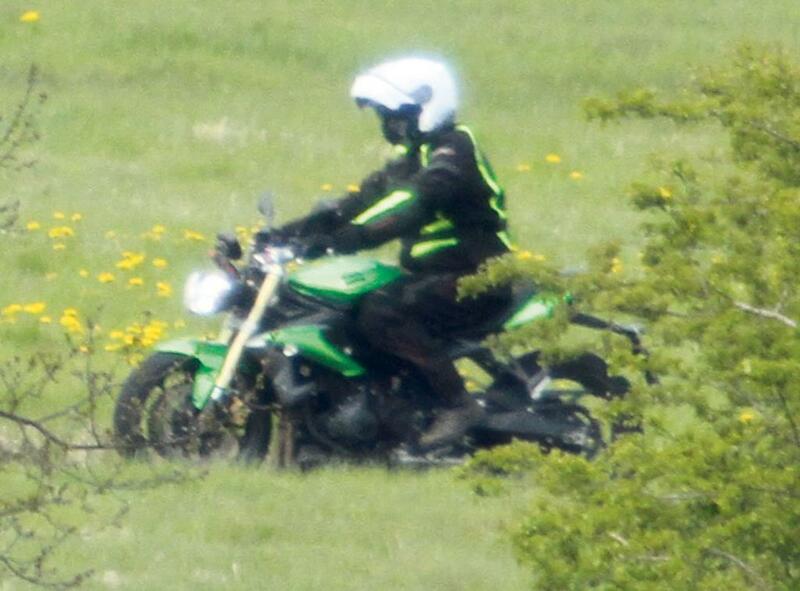 However, we have further evidence in the form of spy pictures that show Triumph are working hard on the development of a new Street Triple. 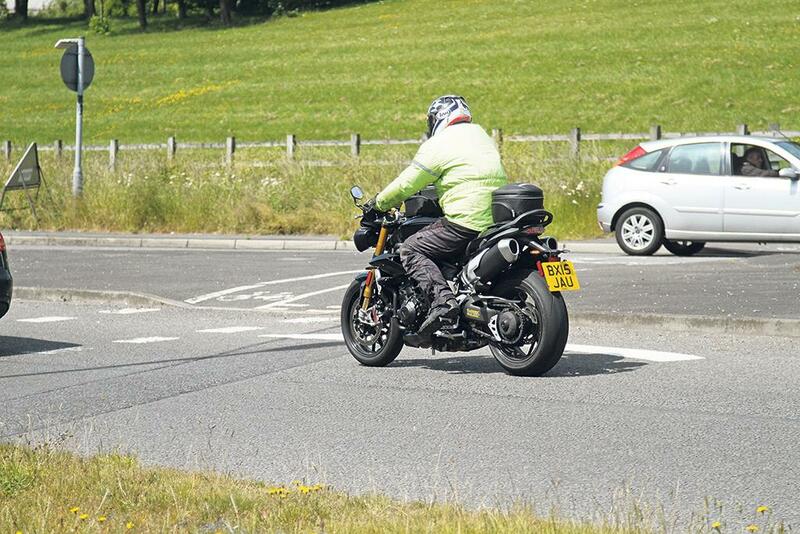 Although it’s impossible to judge the engine capacity, one of the bikes captured by our spy snapper (see left) clearly features the digital instrument display – as detailed by the survey. We’re not expecting big chassis changes, as evidenced by the fact that most of the proposed models will carry over the same suspension as the existing bikes. However, in terms of styling we can expect updates that reflect the alterations being made to the bigger, 1050cc Speed Triple for 2016. Our own spy shots have already revealed that bike in detail (MCN, June 24), including new headlights that are sure to be shared with the of Street Triple. 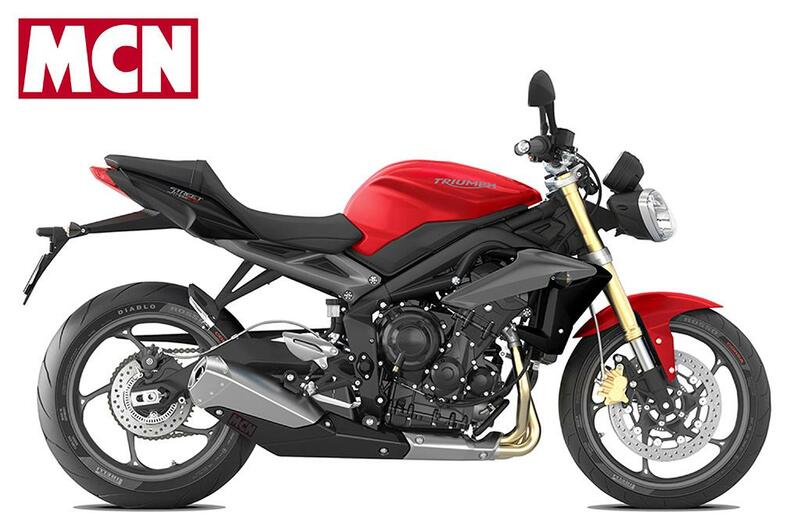 We expect to see the next-generation Street Triple unveiled at the end of 2016, and to go on sale in 2017. A reasonable update is on the cards for the 1050 and we expect to see the finished bike arrive for the 2017 model year. This is more of a cosmetic tidy up than a full model overhaul, but we expect new lights, a new frame headstock, and ram air induction. 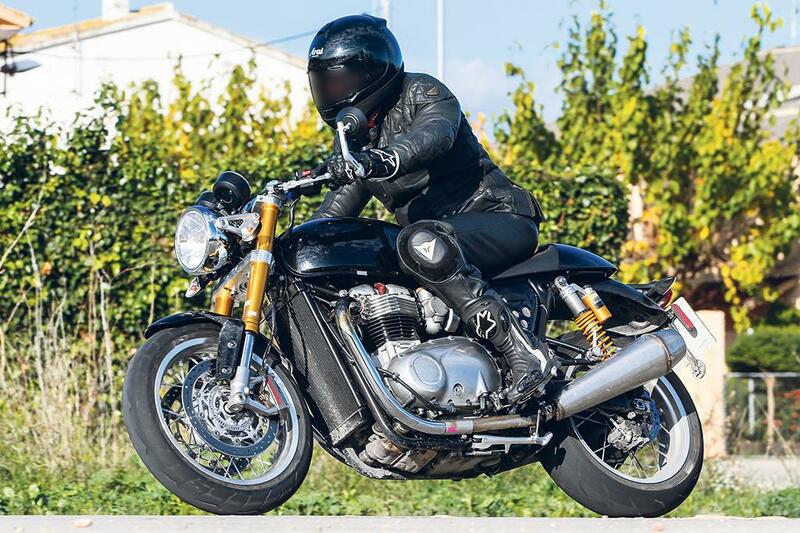 The entire classic range appears to be undergoing a major redevelopment, with an all-new 1100cc water-cooled engine, several different chassis platforms, and a wide array of model styles from classic Bonneville to stripped-down bobber, and high-spec café racer. We expect some models to be released for 2016, with the rest of the range following in 2017. A host of nips and tucks along with some fairly large technological changes are under development for the three-year-old Explorer range, including semi-active suspension, cornering traction control and ABS and a TFT instrument set. Expected for the 2017 model year we think.